This is the final post in a series comparing Amazon leadership principles with Scripture and today we are wrapping it up with Has Backbone, Disagree and Commit and Delivers Results. The previous post was on Vocally Self Critical; Earn Trust of Others; Dive Deep and you can see the full list here. I want to thank the many friends who worked through these principles and the Scriptures together with me over the course of 6 weeks back in October/November–it has been a joy and I thank God for you all! This is the last in our series comparing Amazon leadership principles with Scripture and though there remains room for further study, I hope what I’ve shared has been helpful. The good news is that growing as a leader at Amazon means growing as a Christian and although these principles do not exhaust the fruits of the Spirit or Peter’s list of virtues, let’s thank God that we can excel in following Jesus while succeeding at Amazon. Why is it difficult to have backbone? Can you share examples of where having backbone resulted in a positive or negative outcome? It seems that at the heart of this tension is a distinction over the substance of the disagreement: Don’t disagree over egos, disagree over data (aka the truth). Having backbone is not contrary to Christian gentleness when we are slow to speak, quick to listen, and slow to anger (James 1:19). Forcing your opinion, being aggressive and not listening should not be mistaken for having backbone. Even within Amazon, this principle is balanced by diving deep into the data and being vocally self critical. Thankfully appealing to data and appealing to customers works much of the time in Amazon. It requires more work to sedulously test assumptions and compile the facts, but doing so often influences decisions and produces results. For example, one TPM had a feature that needed buy-in from many stakeholders who were already deluged with other work. By presenting the data and demonstrating its value to the business and our customers, he was able to get the resources despite the pushback from others who were displeased. In Amazon there are so many stakeholders from designers to developers to legal, finance, and other teams that any new initiative is bound to face an intimidating array of challenges. When you get pushback from all sides, you keep striving to overcome them instead of giving up—this principle seems to value perseverance. Why do leaders focus on the key inputs? Perhaps because they cannot control the outcomes, but in a sense they have faith that focusing on the right inputs (which they can control) will result in the output they desire. 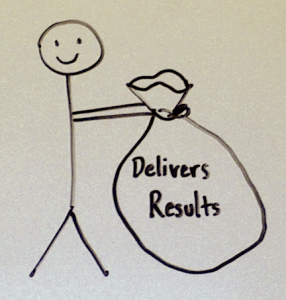 What happens if you fail to deliver a result? This probably ties in with being vocally self critical—admit the problem first and don’t blame it on others. Take responsibility, fail fast and recover. What are relevant Scriptures to this principle? How is there room for grace in a corporate environment? Are “Has Backbone, Disagree and Commit” and “Delivers Results” principles that can and should be applied outside of Amazon to churches for example? Please leave a comment and like/share/tweet/+1 this series if you’ve found it helpful.